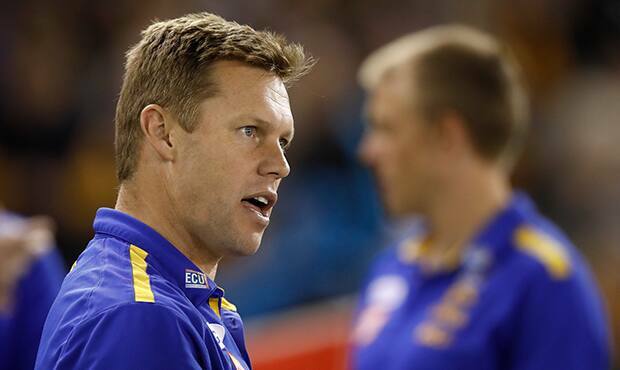 A three quarter time spray from midfield coach Sam Mitchell inspired West Coast’s engine room to dig deep and drag their team over the line against Collingwood, according to Jack Redden. The Eagles trailed the Magpies by 10 points with a quarter to play and Mitchell was far from pleased with the efforts of his onball brigade. Redden said Mitchell’s choice words resonated with the group. “He came down pretty fired up. He knocked the cup out of my hand and it splashed all over my face actually,” Redden said. “It was a slushy, so frozen Gatorade. “He had a word at three quarter time. Our work rate was probably a bit off as midfielders and they were probably outworking us to stoppages. The Eagles responded by winning the fourth quarter contested possession count by 13, inside 50 tally by six, tackle battle by five and clearance war by two. Redden was among West Coast’s best performers in the final term. He amassed 10 possessions, reeled in four marks and kicked a goal after the siren to help seal the 16-point win. The 27-year-old said he was proud of the way he finished off the contest in trying conditions. “You just don’t have the time and space you might in the home and away season, so you’ve got to get rid of the footy pretty quick,” Redden said. “It’s just the tackling and the pressure around the stoppage. You’ve got limited time and you need to dispose of the ball pretty quickly.